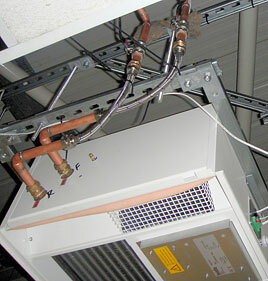 To install an energy efficient heating system suitable to serve a mix of office space and open plan production room. 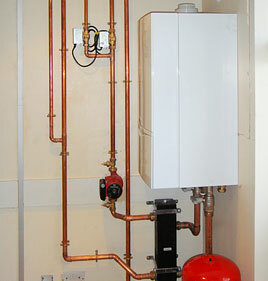 Supply and fit a Vaillant Ecotec Plus 646 condensing system boiler complete with a low loss header. 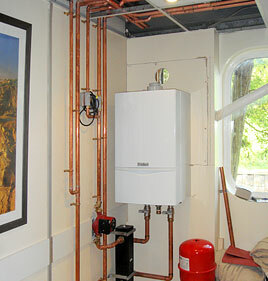 Install a Honeywell S plan system giving thermostatic control over both the heating and hot water. The smaller offices were to be heated by radiators, the large open plan office and production room were to be heated by Biddle Cassettair ceiling mounted fan heaters. 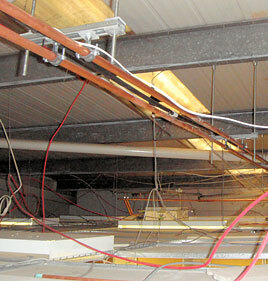 The open plan office and the production room required two units to prevent there being any cold spots. 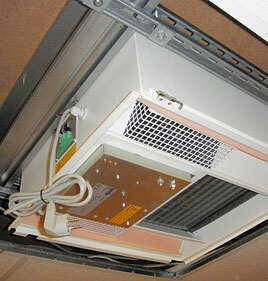 The Cassettair heaters were controlled by a touch pad which adjusted the fan speed to both ceiling heaters and room thermostats for both heaters.